Two first graders at Rosa Parks Elementary record results of an energy audit that they conducted at their school as part of the Green Star Schools program. Last Friday was Earth Day, a day recognized in many countries for celebrating nature and raising awareness about modern problems that afflict the environment. For Rosa Parks Elementary School, it has been an entire Earth year. The elementary school, located in West Berkeley on Allston Way, has been piloting the Green Star Schools program this year - a new green school certification program aimed to reduce the environmental footprint of school campuses while providing students with hands-on learning experiences. 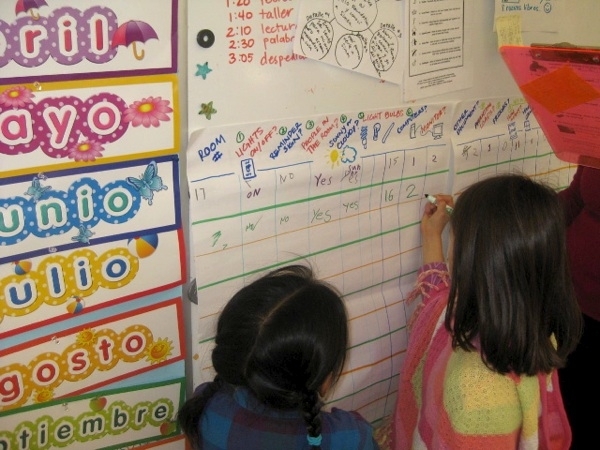 Students at the school in kindergarten through fifth grade have been participating in a variety of action projects since the school year began in the fall. For instance, some classes across different grade levels have audited school garbage systems, energy consumption and water usage to determine where improvements can be made to dampen the school's impact on the environment. "I've learned that everything counts," said Anneleise Tann, a second-grader at Rosa Parks. "Whatever you do that's bad for the environment, that actually counts." In 2004, environmental scientist Deborah Moore noticed that her daughter's school did not place much emphasis on teaching or performing eco-friendly practices. She then co-founded the Green Schools Initiative - a nonprofit organization that has helped develop the certification process Rosa Parks has been pioneering. "The idea behind certification is that schools want to be recognized for the work they are doing, and they also want clear guidelines about what makes them officially green," Moore said. "The problem was that there was nothing really out there for schools to work off of." In July 2010, the initiative was one of 15 recipients of the Chancellor's Community Partnership Fund - a collection of grants meant to support the local community awarded by UC Berkeley Chancellor Robert Birgeneau. In partnership with a second group, the Center for Cities & Schools, the initiative was granted $21,450 to found the Green Star Schools program. Certain science classes at the school have taught how simple actions such as eating less meat and driving less can lower carbon emissions and decrease strains on the environment. The school has also worked with the climate change education program "Cool the Earth" for the past two years. "(The students) have been amazing," said Kim Beeson, a second-grade teacher at Rosa Parks. "We've been having this discussion for years - about how we can integrate more environmental practices at school to provide these real world applications for the students ... Now it's happening." Moore said she expects the program to be implemented at more schools next year and that the initiative ultimately aims to bring about a statewide certification program. On Tuesday, U.S. Secretary of Education Arne Duncan unveiled plans for a federal Green Ribbon Schools program. Moore says she hopes that any future certification program established in California will meet and exceed the new federal certification levels. "Not only is this a great thing for Rosa Parks, we also want it to take effect on the district as a whole," Beeson said. "We want people in Berkeley to keep in mind the environmental aspects of schools when making important decisions."